Confront cannibal spirits, the champions of a fallen empire, and the Runelord of Greed with the Pathfinder Adventure card Game: Spires of Xin-Shalast Adventure Deck. 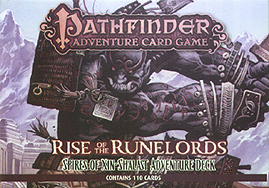 This 110-card expansion to the Pathfinder Adventure Card Game: Rise of the Runelords Base Set includes new locations, monsters, villains, loot, and more, as well as 5 new scenarios that constitute the complete Spires of Xin-Shalast adventure. Bring your character's legend to its epic climax with the Pathfinder Adventure Card Game: Spires of Xin-Shalast Adventure Deck.